An Accessible Pedestrian Signal (APS) provides auditory, visual and tactile information so that a person with vision and/or hearing loss will know when it’s safe (i.e., when the walk phase begins) to cross at a set of traffic signals. In addition, an APS may provide information to help a person with blindness travel in a straight line across a street or roadway. All intersections with traffic control signals should be augmented with APS devices to help with accessible travel for people impacted by blindness. APS devices should be capable of activation 24 hours a day. In general, the time provided for crossing at any intersection or crosswalk, regardless of the presence of an APS, must be programmed to be long enough to accommodate people who may walk at a slower pace, according to this formula: at least zero point eight seconds of crossing time provided per 1,000 mm of crossing distance. While extending the crossing time universally will enhance walkability for pedestrians who may not walk as quickly as others, cities around the world are beginning to implement smart technology. These systems have the capability, when implemented, of providing a custom solution activated by a transit card or device which extends crossing signals based on individual preference or needs. The CNIB Foundation encourages municipal planners to bare these capabilities in mind when sourcing new traffic control systems. An acoustic locator tone should be used to indicate the presence of an APS and its push button. The acoustic locator tone should be audible at no more than 3,700 mm from the push button, or at the closest building line, whichever is closer. The tone should sound no longer than 0.15 seconds and repeat every one to two seconds. The sound-pressure level of an acoustic locator should be between 30 and 90 dB, automatically adjusted to be two to five decibels above ambient sounds. If manually activated, then activation should only require a single press, not pressing and holding the activation button. An audible, visual and vibro-tactile (vibrating) confirmation should be provided to indicate the system has been successfully activated by the push button. An audible, visual and vibro-tactile walk signal should indicate when it’s safe to cross the street. The walk signal volume at the point of departure should be carefully controlled to ensure it’s loud enough for someone at the departure curb to hear it properly. Unless sound beaconing is used, it should be automatically adjusted to be two to five decibels louder than the ambient noise level. Take care to ensure that for people with hearing loss, the audible signal won’t be confused with other sounds, such as birds chirping. A tactile, colour-contrasted arrow should unambiguously indicate the direction of travel associated with any push button. The name of the street to be crossed should be made available in uncontracted braille, raised print characters and an audible format. Braille and raised print characters should be located on or near the push-button assembly. Photo of a pedestrian crossing with a push button that incorporates a tactile arrow to indicate the direction of crossing and a tactile map showing the lane configuration along the crossing route. Sound beaconing of the acoustic walk signal assists people in establishing and maintaining a straight line of travel across the road. Careful placement of the APS push button within the width of the crosswalk indicates the direction associated with it (for more information see Push-button location, below). A tactile map shows the lane configuration. Place it adjacent to a clear level ground surface that’s stable, firm and slip resistant within 300 mm of the push button. This may be adjacent to or part of the pedestrian sidewalk. Provide a high-contrast ratio information sign, mounted above the push button, with the face of the sign parallel to the crossing route. Mount the push button on the pole at a height of 1,000 - 1,250 mm. Place the push button on the side of the pole facing the pedestrian waiting area. Its face should be parallel to the associated crosswalk. Locate the push button near the extended crosswalk line that’s farthest from the movement of parallel traffic. Set the APS back no farther than 600 mm from this line. If there are two APS buttons on the same corner (i.e., two separate directions of travel), separate them by at least 3,000 mm. In some locations, circumstances may dictate the placement of APS push buttons for two directions of travel on a single pole (a situation to be avoided wherever possible). If this is necessary, place each push button on the side of the pole facing the pedestrian waiting area. Align the face of each unit to be parallel to the associated crosswalk. Snow collected in snow removal shouldn’t be piled at the base of poles where APSs are mounted. It should be piled on the far side of poles to ensure an unobstructed path of travel. Pedestrians with blindness shouldn’t need to navigate a three or four foot bank of snow to activate the APS. When APSs are used at pedestrian crosswalks, follow the same guidelines listed for APS devices at intersections above. For detailed information on APS devices, refer to “Guidelines for Understanding, Use and Implementation of Accessible Pedestrian Signals,” available from the Transportation Association of Canada’s website bookstore. Ensure push buttons for traffic lights are free of obstacles (e.g., guardrails). Mount push buttons between 1,000 and 1,200 mm. Contrast the colour of the push buttons to adjacent materials. 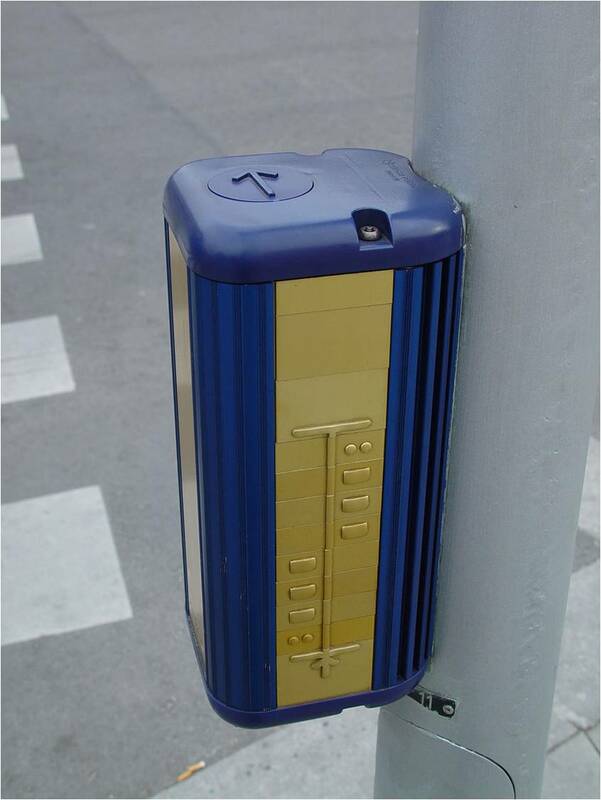 Even if locater beacons are functioning as expected, locating a pole and activating theAPS system can be difficult for many pedestrians. Activating an APS via a push button requires a combination of reach, strength and dexterity. A large range of conditions can affect these abilities such as Amyotrophic Lateral Sclerosis (ALS), Parkinson’s, Rheumatoid Arthritis, Muscular Dystrophy, Cerebral Palsy, Multiple Sclerosis or any degenerative disease. Where more than one APS activation button exists, the need to make contact with it requires finding the appropriate button for the direction sought; this can prove particularly daunting for someone who is blind and unfamiliar with the layout of an intersection. Locating a button housing(s) may require a pedestrian with sight loss to veer from their path of travel to activate an APS, then to realign themselves with a crossing. This can significantly hinder their orientation. Despite CNIB’s guidelines, taken from various standards and best practices, pole placement can be dramatically influenced by complex engineering or design considerations. The end result is an inconsistent and unpredictable placement of poles. This will require a pedestrian with sight loss to explore until they find the pole and locate the correct activation button. This exploration will often result in a pedestrian losing their orientation to the crossing. Pole placement also becomes an issue for pedestrians with mobility impairments. For example, when poles are located in beds of grass, they are often entirely inaccessible to pedestrians using mobility devices as they often cannot come close enough to make contact with the button. Despite existing standards requiring that poles are located within 1.5m maximum distance between the pole and the curb, seasonal conditions, placement of sidewalk elements and other mitigating factors can result in poles being situated beyond a pedestrians easy reach. Conventional traffic control systems are extremely limited with respect to the information provided to pedestrians who are blind. At best, a traditional APS system can provide an audible signal when the walk is on, however, there are other key pieces of information that sighted pedestrians receive that help them cross the street safely. This can include count down timers or general orientation information.